As noted in an earlier post, my son Griffin is now in the PhD program in Biochemistry and Molecular Biophysics at CalTech University in Pasadena. So while on a recent visit to southern California I got the chance to check off one of items on my bucket list --- scuba diving in a kelp forest. 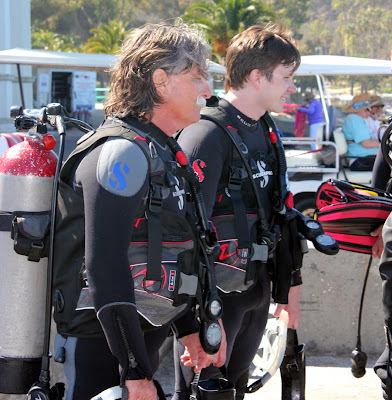 Griffin and I, in wet suits and geared up with masks, air tanks, regulators, and flippers, gaze at a distant kelp forest just before the dive. I’ve always had a thing for kelp forests. I’ve watched many nature programs about kelp forests and always thought how wonderful it would be to actually explore one. So while on Catalina Island we seized the opportunity, diving to 50 feet and having, what we both agree, is one of the most amazing experiences of our lives. As remarkable as a kelp forest might look in an IMAX theater, that is nothing compared to the real thing. We swim out to the descent point, Catalina Island. Kelp forests are among the most diverse and productive ecosystems on the planet. They are adapted to cool, coastal, subtidal waters but life is in abundance there. Dense stands of giant kelp, rising from the ocean floor to the waters’ surface, provide a home for close to 300 species of algae and animals. 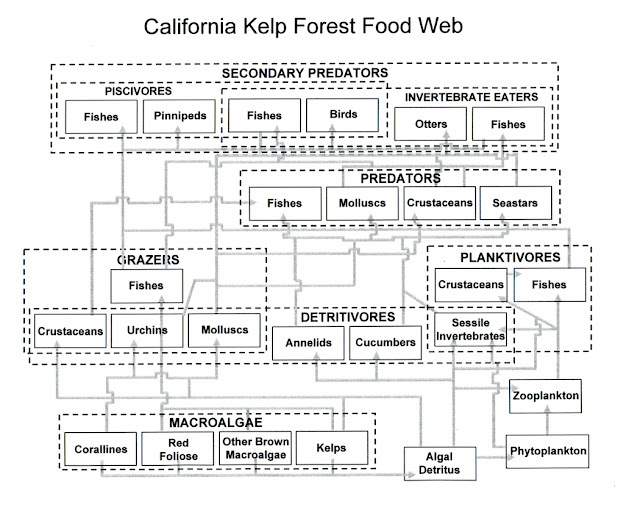 It's no surprise that a kelp forest, containing hundreds of species, has a very complex food web. 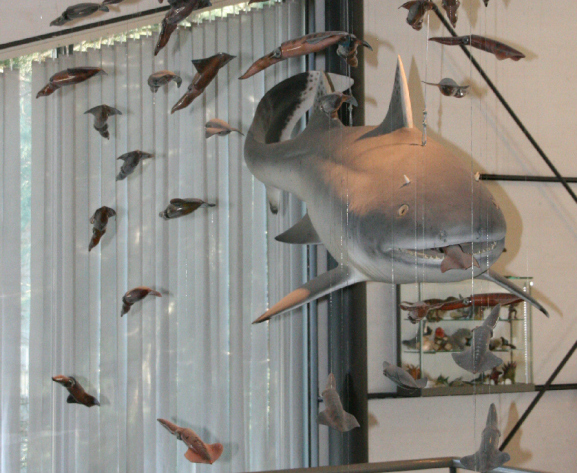 Even after nearly a century of study many details of this food web remain poorly understood. Fish are plentiful, colorful, and quite unafraid of divers, often passing unconcerned within mere inches of your mask. One of the dominant giant brown algae of the forest is the Giant Kelp (Macrocystis pyrifera). It is a most remarkable organism. As the fastest growing living thing, during the peak of its growing season it can grow up to 50cm (2 ft) per day. Upon reaching the water’s surface, Macrocystis continues to grow and spread out on the surface, providing a tree like canopy above the ocean floor. It is also one of the largest organisms on Earth, reaching a length of 45 m (150 ft) --- surpassing even blue whales and sauropod dinosaurs! Spreading across the ocean's surface giant kelp forests form a canopy like that of trees in a terrestrial forest. And giant kelp are strikingly beautiful, with long, blade-like leaves and stems a rich golden brown and with numerous gas filled sacs that help keep it upright as it grows towards the surface. Spherical, gas-filled chambers along the "leaves" of Macrocystis help keep this giant upright in the water. As I’ve written in past posts, seeing something interesting in the modern world often brings to my mind the question “What is this things fossil record like?” The kelp forest is no exception. 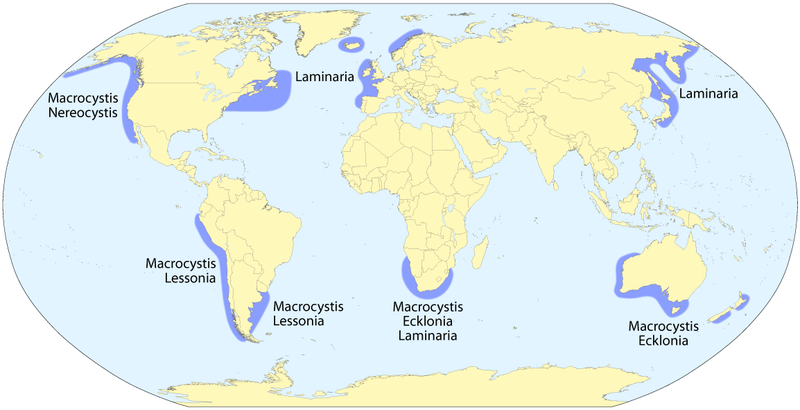 The global distribution of modern kelp forests. Names refer to the dominant kelp in each forest. Kelp have a tough, rubbery feel to them. When handling the long stems, they bend rather than snap. This flexibility allows them to sway in ocean swells. Although the leaf-like blades are thinner, they have a similar rubbery feel. So it would seem that given this apparent toughness and the immense size of Macrocystis kelp forests, there should be a reasonable fossil record for this alga. 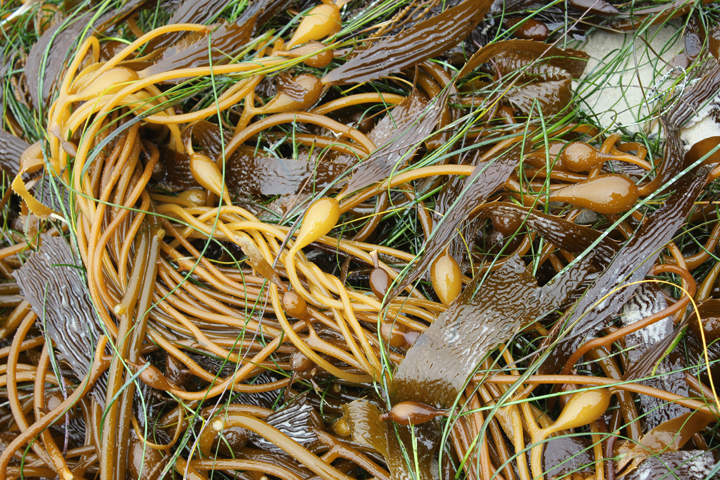 Although rubbery, the lack of any hard parts makes the preservation of kelp very difficult. 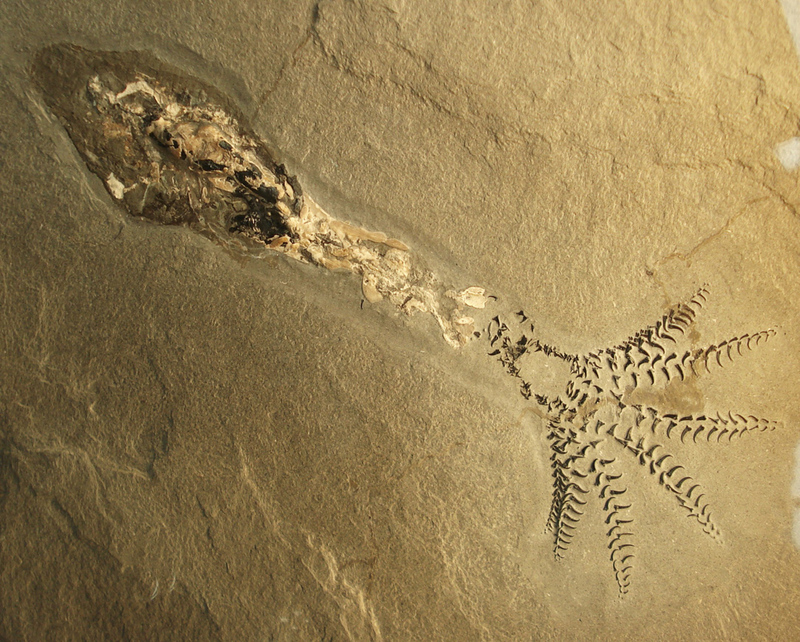 Fossils of brown algae (the Phaeophyta) have been reported far back in the rock record, but many of the reports are disputed. 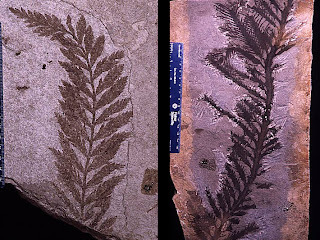 Often preservation is not such that one can see the necessary cellular detail in the fossil to confirm phaeophyte affinities. These fossils may actually belong to other groups of marine algae (especially red algae) and in some cases they have turned out to not even be fossils at all! In spite of being rubbery, tough, and abundant, Macrocystis (seen here) and other giant kelp have a very poor fossil record. The oldest definite kelp fossils are from the Monterey Formation of California. That formation is Miocene in age and the fossils are relatively young, only 13-17 million-years or so. At least 5 species of phaeophytes are known from these deposits and the formation has the greatest fossil record for the group anywhere in the world. 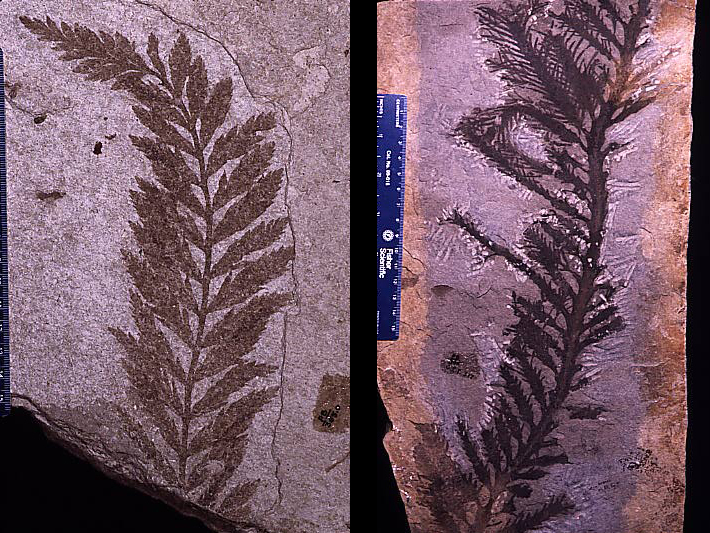 Paleocystophora subopposita (left) and Paleohalidrys superba (right), two of the magnificent brown algae fossils found in the Monterey Formation. 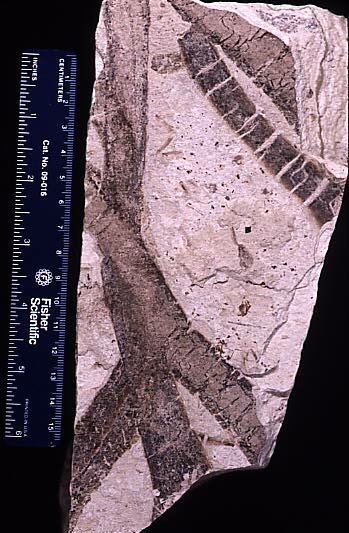 One of these fossils, Julescraneia grandicornis, appears to be related to giant kelp that form modern kelp forests, although some paleontologists disagree with that interpretation of Julescraneia. Unfortunately, it is only known from two incomplete specimens. However, if it is a giant kelp, then it gives us a minimum age for the origin of giant kelp, although that does not mean that those kelp necessarily formed forests. 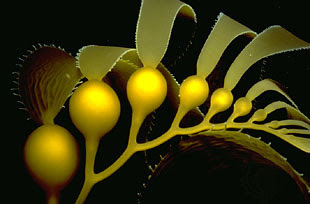 Jamescraneia is a tantalizing, but rare, fossil that may mark the beginning of giant kelp evolution. Given that the fossil record for brown algae (in general) and giant kelp (more specifically) is exceedingly poor and full of uncertainties, how can we ever know about the evolution of kelp forests? Well not all is lost just because of a poor fossil record. There are physical features preserved in the rock record that can be correlated with environmental parameters closely enough that they can stand in for a direct measurement of those environmental parameters. Thus, using the former (known as proxies) can help us explore the past with a high degree of confidence. 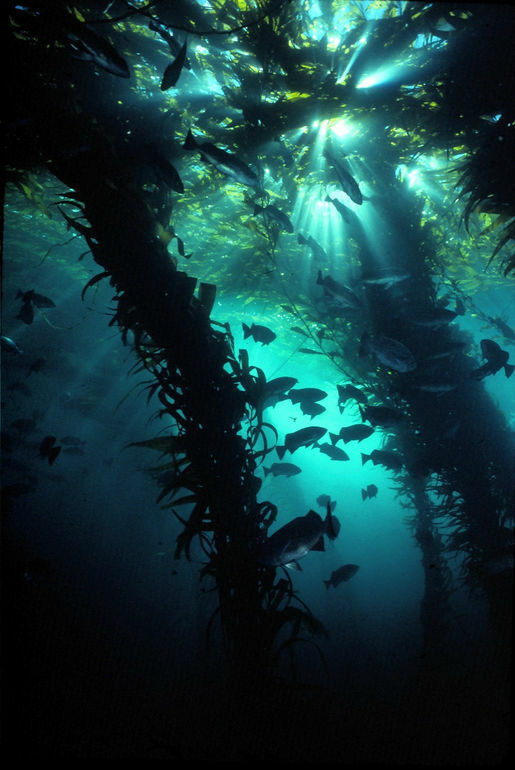 Modern kelp forest distribution in southern California is strongly dependent on 1) water depth of less than 25m, 2) a rocky bottom, and 3) cold, nutrient rich water. Proxies for each of these exist in the geology southern California area. 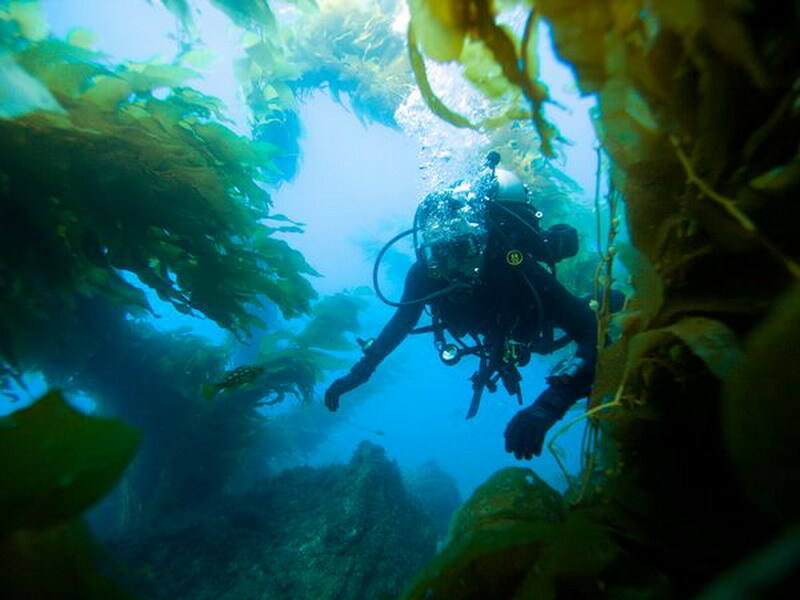 The kelp forests of southern California are the most extensive and best studied in the world. In addition, the detailed geological record of the shoreline and near shore ocean provides outstanding information about how that environment changed over time. Furthermore a rich and well studied archeological record from the area documents the use of the kelp forest and its fauna over the last 20,000 years. Such a detailed set of overlapping studies does not exist for any other kelp forest in the world. The study is both elegant and detailed and I will summarize just the main conclusions. Readers interested in more details should look at the paper by Graham, Kinlan, and Grosberg published in 2010 (see sources below). As might be expected, kelp forest area varied widely over the time being studied. First, as sea level rose, the kelp forest area on the many large off shore islands doubled (or in some cases nearly tripled) over the first 7,000 years. This was due to the ocean flooding extensive wave cut terraces on the islands. However, as these terraces flooded further, vast areas became deeper than 25m and the flooded terraces eventually became too deep for the kelp. As a result the island kelp forest area then decreased by 60%. Along the shoreline of the mainland the story is different. Kelp forest area gradually increased to as much as 670% of its initial area during the first 12,000 years and then shrunk to 80% of that area. 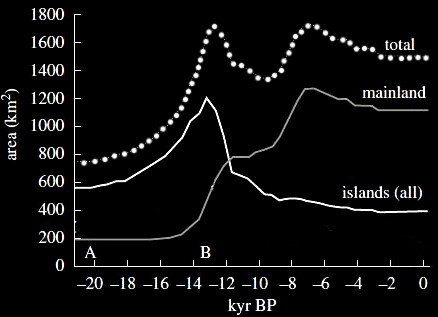 Graph of the size of kelp forests over the last ~20,000 years (oldest records to left). Note the different history of kelp forest expansion between islands and mainland shoreline kelp forests and the overall increase in total kelp forest area. (Modified from Graham et al. 2010). 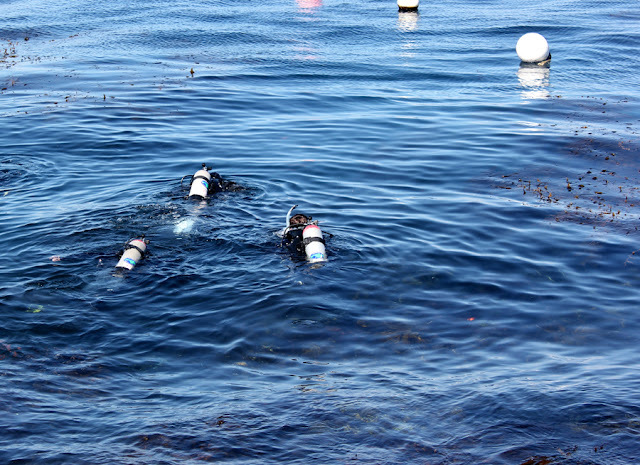 Although Graham’s study was restricted to southern California, the physical factors that control kelp forest distribution on a global basis are generally the same, so similar dramatic changes in those forests probably occurred around the world since the last glacial maximum. So kelp forests are better off than they were during the last glacial ice sheet maximum. However, they are still threatened by pollution, overharvesting of kelp, and many other human activities. Just because they are forests in the ocean does not mean that they cannot be destroyed just as have forests on land. Keeping kelp forests healthy and growing is important, even crucial, both ecologically and economically. As I now know from first hand experience a walk through a forest can be fascinating but a swim through a forest is just mind-boggling. Dayton, P. K. 1985 Ecology of kelp communities. Annual Review of Ecology and Systematics 16: 215–245. Graham, M.H., Dayton, P.K., and Erlandson, J.M. 2003. Ice ages and ecological transitions on temperate coasts. Trends in Ecology and Evolution 18(1): 33-40. Graham, M. H., Halpern, B. S., and Carr, M. H. 2008. Diversity and dynamics of Californian subtidal kelp forests. Food Webs and the Dynamics of Marine Reefs. Oxford University Press, New York, 103-134. Graham, M.H., Vasquez, J.A., and Buschmann, A.H. 2007. Global ecology of the giant kelp Macrocystis: from ecotypes to ecosystems. Oceanography and Marine Biology 45: 39-88. Hendy, I. L., Pedersen, T. F., Kennett, J. P. and Tada, R. 2004. Intermittent existence of a southern Californian upwelling cell during submillennial climate change of the last 60 kyr. Paleoceanography 19: 3007–3012. Kennett, J. P. and Ingram, B. L. 1995. A 20 000-year record of ocean circulation and climate change from the Santa Barbara Basin. Nature 377, 510–512. Kinlan, B. P., Graham, M. H. & Erlandson, J. M. 2005. Late-Quaternary changes in the size and shape of the California Channel Islands: implications for marine subsidies to terrestrial communities. Proc. Calif. Isl. Symp. 6: 119–130. Tegner, M. J., and Dayton, P. K. 2000. Ecosystem effects of fishing in kelp forest communities. ICES Journal of Marine Science: Journal du Conseil, 57(3), 579-589. Spreading across the ocean’s surface…. Squid is an acquired taste – one that many people cheerfully never acquire (check out the Odori-do video clip at <http://www.youtube.com/watch?v=dxQmOR_QLfQ> for a good reason why). But many marine organisms relish them. 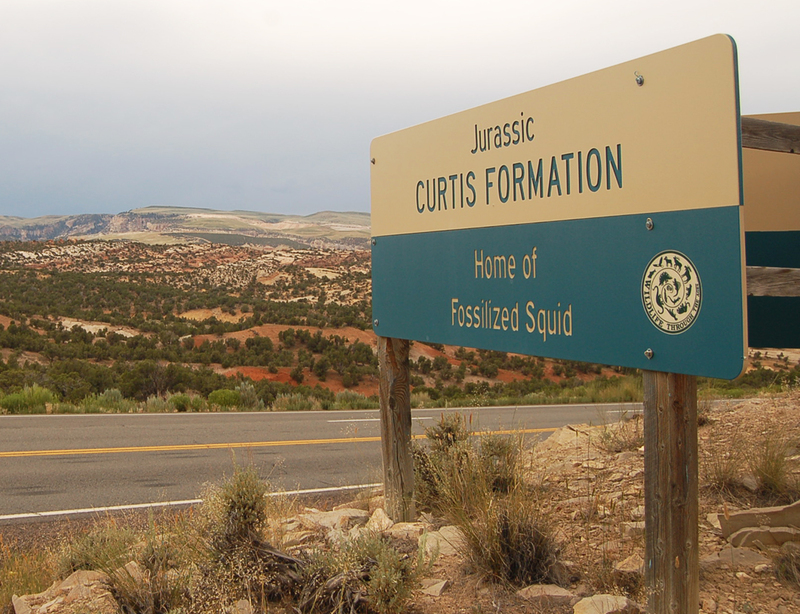 Most living squid species lack any internal hard parts, making them poor candidates for fossilization. However, extinct, primitive squid (known as belemnoids), have substantial hard parts that can sometimes provide us a remarkable look into ancient ocean food chains. 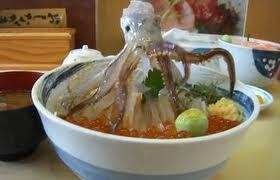 As if raw squid wasn't bad enough, this Japanese dish Odori-don really brings a meal to life. 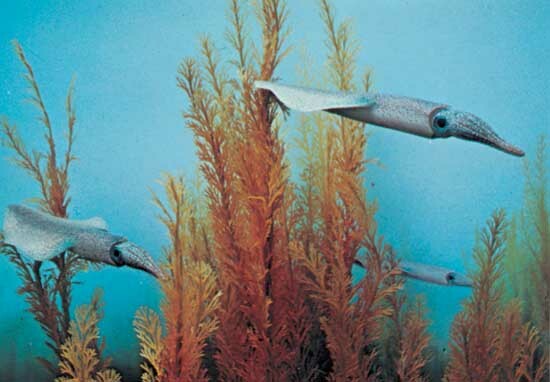 If you were scuba diving in the seas of the Mesozoic and had the opportunity to see a living belemnoid you would instantly recognize it as a squid. They had a long, tubular, fleshy body, paired fins at the back end, large eyes, and ten arms surrounding the mouth. Most grew to a length of about 1 foot, although some (Megateuthis gigantea) reached nearly 10 feet. A well preserved belemnoid with fossilized soft tissues. As with many living squid, belemnoids traveled and fed in groups. These were carnivores and at least one remarkable belemnoid fossil is preserved with its fish prey still held captive in its arms. A well preserved belemnoid with its fishy prey still entangled in its arms. Another 160,000,000 million-year-old belemnoid preserves an ink-sac, showing that, like their modern descendent, belemnoids used ink to confuse and escape predators. The fleshy arms of belemnoids seem to not have suckers but instead bore rows of sharp, mineralized hooks. 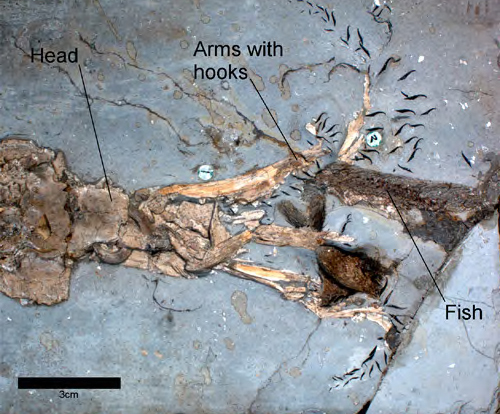 The hooks can be easily fossilized, sometimes revealing the shape and arrangement of the arms, even though the flesh of the arms is not preserved. A beautiful fossil of Phragmoteuthis conocauda exhibiting rows of arm hooks. 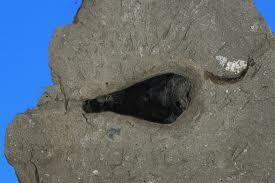 Belemnoids had a heavily mineralized, bullet shaped internal "shell". This hard part is durable and is the most common kind of belemnoid fossil. They can occur in remarkable abundance. The fossilized internal shell of a belemnoid (above) and a drawing of how it fit (shown in white) in the living animal (below). In the middle Jurassic marine beds in and around Dinosaur National Monument known as the Curtis Formation, those belemnoid fossils are common enough to earn their own tourist sign along the Drive Through The Ages on US 191 running north from Vernal, Utah. While belemnoids were common carnivores, they were by no means at the top of the food chain, and their remains have been found in the fossilized stomachs of several groups of predatory Mesozoic marine reptiles. 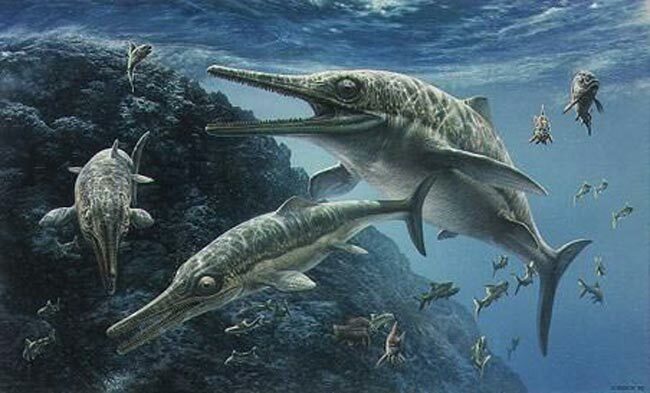 The porpoise/whale like ichthyosaurs (above) and the unearthly plesiosaurs (below) were two groups of Mesozoic marine reptiles that regularly fed on belemnoids. Pollard (1966) described masses of belemnoid hooks preserved in the stomachs of ichthyosaurs. 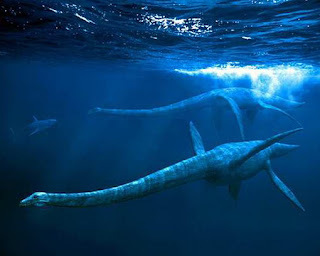 Boucot and Poinar (2010) reported similar occurrences in plesiosaur stomachs. The magnificent fossil of the shark Hybodus hauffianus. The original is on exhibit at the Staatliches Museum fur Naturkunde, Stuttgart. 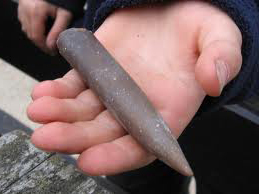 However, the most spectacular occurrence of belemnites as prey comes from a skeleton of male Jurassic shark Hybodus hauffianus from the 180,000,000 year-old Posidonia Shale, a rock formation deposited on the floor of a Jurassic sea. 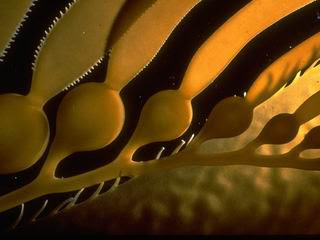 We know it is male because of the presence of pelvic claspers which are used during copulation. It is one of those rare shark fossils that preserves not just the teeth, but the entire cartilaginous skeleton as well as the skin, thus giving a detailed outline of the shark’s shape. To top this off, it has preserved stomach contents consisting of a mass of over 200 closely packed belemnoid internal shells. Sharks have strong stomach acids yet these ancient squid fossils are very well preserved, indicating that the shark died soon after dining on a shoal of belemnoids. 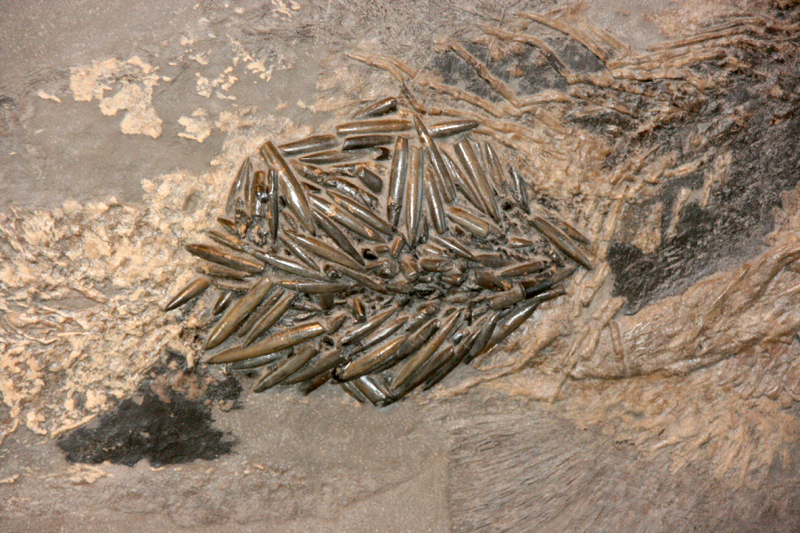 Detail of the Hybodus huffianus specimen, showing a stomach filled with the internal shells of belemnoids. But this Hybodus fossil provides even more insight into ancient feeding behavior. 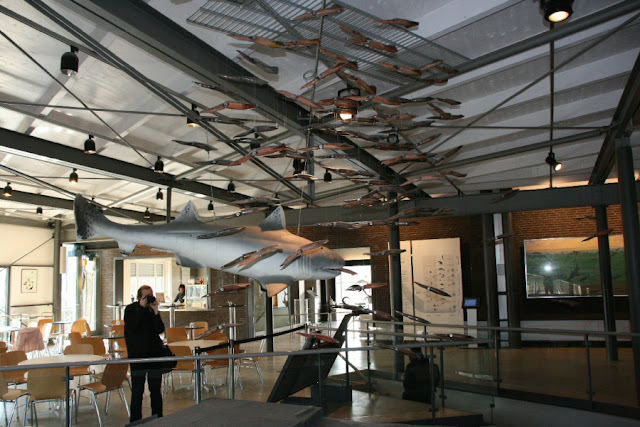 The shark fossil has preserved internal shells but the numerous ichthyosaur and plesiosaur specimens with belemnoids in their stomach contain only the hooks from the arms. A likely explanation for this pattern is that Hybodus ate the squid whole, while the marine reptiles ate the arms and head but not the body containing the thick internal shell. Finally, a fantastical exhibit in the Urwelt-Museum Hauff in Germany really brings this magnificent shark fossil to life. 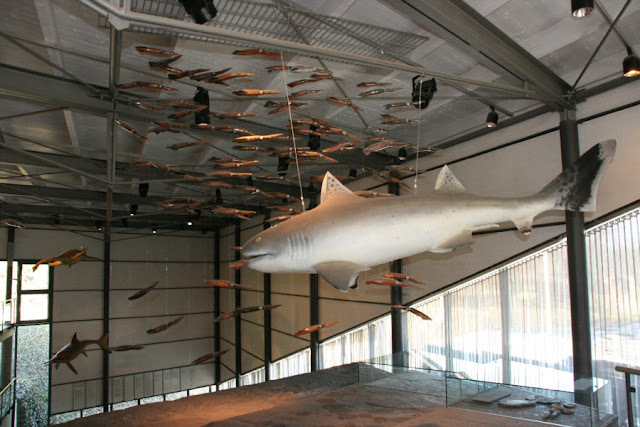 Hanging from the ceiling is a life size flesh restoration of Hybodus swimming through and feeding on a shoal of belemnoids, with one partially sticking out of its mouth. Cleverly, this exhibit is near the entrance to the museum’s cafeteria, although it is unclear what calamari dishes are on the menu. Thanks to Ben Creisler for directing me to a pdf of Schmidt’s 1921 paper on the Hybodus specimen. Boucot, A.J. and Poinar, G.O. 2010. Fossil Behavior Compendium. CRC Press: 424 pages. Schmidt, 1921. Hybodus hauffianus und die Belemnitenschlachtfelder. Jh.